What are employee benefits? What benefits and perks can you expect to receive when you're hired by a company? An employee benefits package includes all the non-wage benefits, like insurance and paid time off, provided by an employer. There are some types of employee benefits that are mandated by law, including minimum wage, overtime, leave under the Family Medical Leave Act, unemployment, and workers compensation and disability. There are other types of employee benefits that companies are not required to offer, but choose to provide to their employees. There are some benefits and perks you may be able to negotiate as part of your compensation package when you've been offered a new job. Employee benefits are non-salary compensation that can vary from company to company. Benefits are indirect and non-cash payments within a compensation package. They are provided by organizations in addition to salary to create a competitive package for the potential employee. The following are compensation and benefits that employers are required by federal or state law to provide. 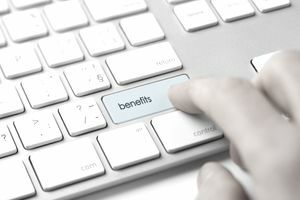 In addition to benefits required by law, other benefits are provided by companies because they feel socially responsible to their employees and opt to offer them more than is required by law. Depending on the company, these benefits may include health insurance (required to be offered by larger companies), dental insurance, vision care, life insurance, paid vacation leave, personal leave, sick leave, child care, fitness, a retirement plan, and other optional benefits offered to employees and their families. These types of employee benefits that are offered are at the discretion of the employer or are covered under a labor agreement, so they will vary from company to company. According to the Bureau of Labor Statistics, the average number of annual paid holidays is 10. The average amount of vacation days are 9.4 after a year of service. Almost half the (medium and large) employers surveyed offered either a defined benefit or a defined contribution pension plan. About 75% offered health insurance, but almost all required some employee contribution towards the cost. It's not hard to look at the averages and see how your employer or your job offer measures up. In addition, there is an increasing use of bonuses, perks, and incentives by employers to recruit and retain employees. Look at the companies rated the best places to work and you'll discover many offer health club memberships, flexible schedules, daycare, tuition reimbursement, and even on-site dry cleaning. Under the Patient Protection and Affordable Care Act (Obamacare), minimum standards are set for health insurance companies regarding services and coverage. Most employers with 50 or more employees are required to offer health care plans, and individuals are required to have coverage. Health care exchanges have been set up for employees who aren't covered by employers or who elect to seek coverage outside their employer plans. Most employers present staff with group medical insurance plans to assist workers with health care costs. Employers often provide a menu of options for health care plans including Health Maintenance Organizations (HMOs) and Preferred Provider Organizations (PPOs). Deductibles (how much workers must pay before insurance kicks in) co-pays required for specific services and premiums for plans vary. HMOs tend to have lower premiums than PPOs, but more restrictions in terms of the physicians and providers who can be accessed. Plans will differ regarding the maximum out-of-pocket expenses that an employee would need to shoulder during a plan year. Most plans provide coverage for visits to primary care physicians and specialists, hospitalization, and emergency care. Alternative medical care, wellness, prescription, vision, and dental care coverage will vary by the plan and employer. Employers are required to provide health care to employees who work at least 30 hours per week. Some part-time workers are covered by employer plans, but many are not covered. Some employers provide an incentive for employees to opt out of their plan. Recent trends indicate that employers are asking workers to shoulder an increasing percentage of the premium for plans. Companies with dental care benefits offer insurance that helps pay a portion of the cost for dental treatment and care. Depending on the company’s policy for dental care benefits, dental coverage includes a range of treatments and procedures. Most insurance plans cover the basic procedures such as routine teeth cleaning every six months. Dental care plans can vary from company to company, but they typically include three categories: Preventive, Basic, and Major services, which vary from semi-annual cleanings to oral surgeries. Preventative dental benefits include exams, x-rays, sealants, fluoride treatments, and children’s basic care. Basic services would also include fillings, emergency pain relief, root canals, and dental crowns. Finally, Major services can include bridgework, wisdom teeth removal, dentures, and other complex procedures. Some plans cover all practices, like orthodontic work in addition to basic dental care. The actual benefits of dental care plans are calculated in several ways. Some companies base their coverage on usual, customary, and reasonable (UCR) fees, while others consider the inclusions on account of a fixed fee schedule or table of allowances. Knowing the benefits and exclusions of your Dental Plan can allow you to evade unexpected fees and co-pays. If you have to pay for dental coverage through your employer, here's how to determine whether it's worth the expense. These types of employee benefits that are offered are at the discretion of the employer or are covered under a labor agreement, so they will vary from company to company. Other benefits can vary between industries and businesses and are sometimes referred to as “fringe” benefits. These perks, also known as “benefits in kind” can include bonuses, profit sharing, medical, disability, and life insurance, paid vacations, free meals, use of a company car, pensions, stock options, childcare, gratuity, company holidays, personal days, sick leave, other time off from work, retirement and pension plan contributions, tuition assistance or reimbursement for employees and/or their families, discounts on company products and services, housing, and other benefits and perks that are provided by companies in addition to the employee's salary. While these benefits are meaningful and do hold monetary value, the employee’s salary remains the same, and the employee cannot “cash in” or trade the offers for a higher salary. Fringe benefits are not required by law and vary from employer to employer. Whether you are job searching, deciding on a job offer, or happily employed, it's important to review what benefit coverage is provided by the company and to decide whether the employee benefits package is one that fully meets your needs. It's also important to take full advantage of what the company provides to employees. There are employee benefits questions you should ask, to ensure that your overall compensation plan is right for you and for your family. Also, ask specific questions based on your needs and on the criteria that are important to you.